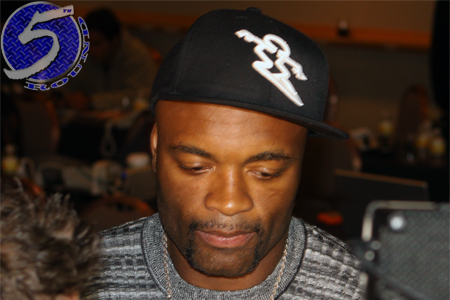 If Chris Weidman serves up and upset special this Saturday at UFC 162, which a growing number of MMA enthusiasts are starting to believe it won’t be THAT big of an upset anymore, UFC president Dana White has promised reigning middleweight king Anderson Silva (pictured) will be granted an immediate rematch. White’s announcement isn’t too shocking. If anyone deserves an instant sequel, it is the Octagon’s most decorated champion. Silva is perfect through his past 17 fights, with his last 16 coming under the UFC’s watch. The 38-year-old owns a UFC record 10 successful title defenses. Weidman, meanwhile, is unbeaten in nine professional fights. While the “All-American” has less pro scraps under his belt than Silva has title defenses, many are starting to believe “The Spider’s” lengthy reign could be coming to a screeching halt in four days. Silva opened as nearly a 3-to-1 odds-on favorite to retain his title at UFC 162, but his line is quickly dipping. Silva is now at -240, the lowest he’s been rated against an opponent since his -140 status against Dan Henderson at UFC 82. Weidman went from a +210 underdog to +190 in just a matter of days.